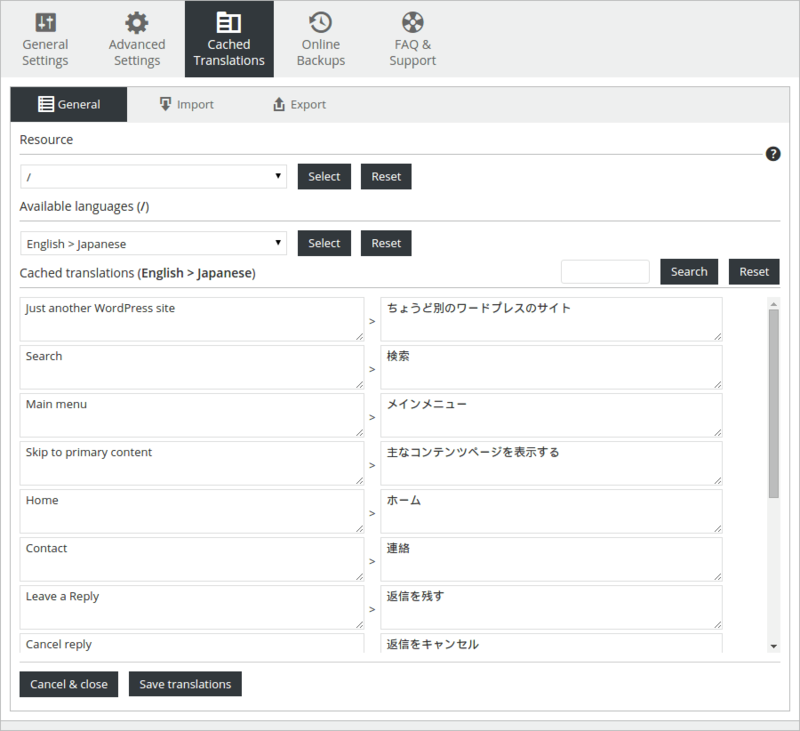 Translator Revolution WordPress Plugin is a user-friendly, highly customizable WordPress translation plugin. It works making it simple to get started, but powerful enough to create highly customized translator setups. A total of 103 languages are supported for automatic translation: Afrikaans, Albanian, Amharic, Arabic, Armenian, Azerbaijani, Basque, Belarusian, Bengali, Bosnian, Bulgarian, Catalan, Cebuano, Chichewa, Chinese Simplified, Chinese Traditional, Corsican, Croatian, Czech, Danish, Dutch, English, Esperanto, Estonian, Filipino, Finnish, French, Frisian, Galician, Georgian, German, Greek, Haitian Creole, Hausa, Hawaiian, Hebrew, Hindi, Hmong, Hungarian, Icelandic, Igbo, Indonesian, Irish, Italian, Japanese, Javanese, Kannada, Kazakh, Khmer, Korean, Kurdish, Kyrgyz, Lao, Latin, Latvian, Lithuanian, Luxembourgish, Macedonian, Malagasy, Malay, Malayalam, Maltese, Maori, Marathi, Mongolian, Burmese, Nepali, Norwegian, Pashto, Persian, Polish, Portuguese, Punjabi, Romanian, Russian, Serbian, Sesotho, Sinhala, Slovak, Slovenian, Somali, Samoan, Scots Gaelic, Shona, Sindhi, Spanish, Sundanese, Swahili, Swedish, Tajik, Tamil, Telugu, Thai, Turkish, Ukrainian, Urdu, Uzbek, Vietnamese, Welsh, Xhosa, Yiddish, Yoruba, Zulu. Support. Fast and competent. When you need help or have a question, you just want the answer ASAP. You won’t need to register to a 3rd party plataform, nor you’ll get a ticket number as you won’t need it to demand attention. A simple message from the profile page will be enough. Customer Support is the top reason of 5 Star ratings, check the Reviews tab. So you can rest assure you’ll be assisted not only in a timely manner, but your expectations will be fulfilled too. Easy to follow installation guide (with HD Videos). The default location of the translation bar is on top of the website. And it can be also used as a widget. If your theme doesn’t have a widget area in the location you want, then there’s no problem as you can use the custom positioning settings to place it anywhere. Translate everything, or precisely select and/or exclude sections from the web pages. Exclude entire pages, posts and categories. Show languages flags and names, or just names, or just flags. A total of 87 settings to customize. 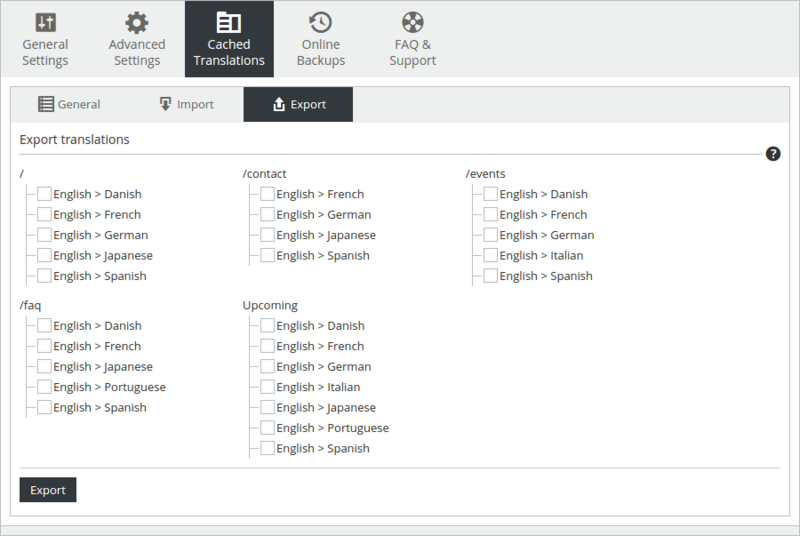 SurStudio Translate API (gateway to Google Translate, although is free for buyers). Specify the number of concurrent calls. 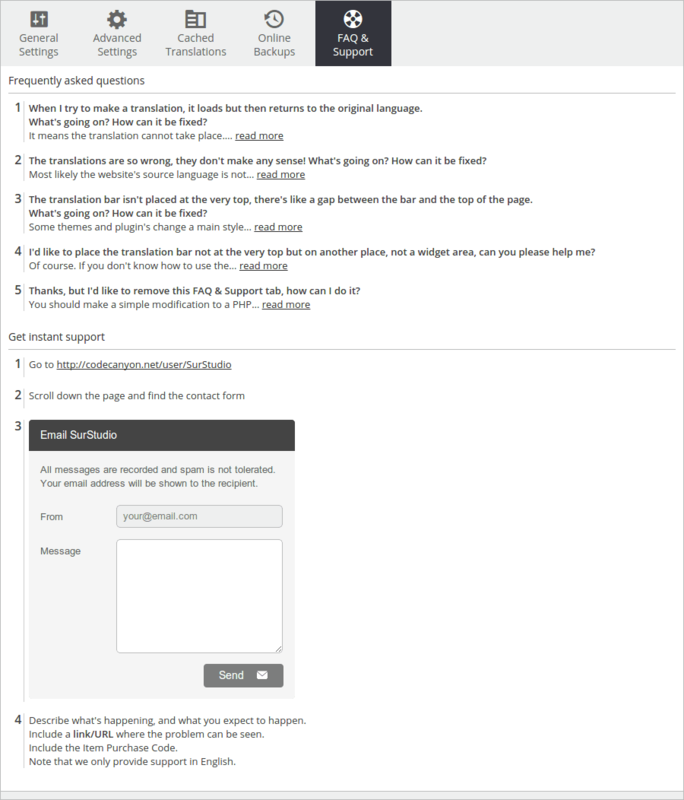 Useful for large web pages to find a balance between the translation time and the browser’s resources to consume. Define a custom translator by specifying the HTML code and attaching the functionality. Template system to highly customize the default HTML structure. Added new 12 new languages. Added new option to grant permissions to edit translations based on user roles. Added new option to translate the placeholder attribute. Added new 28 new languages. Added new option to show or hide either flags and language names depending on the device’s screen resolution. 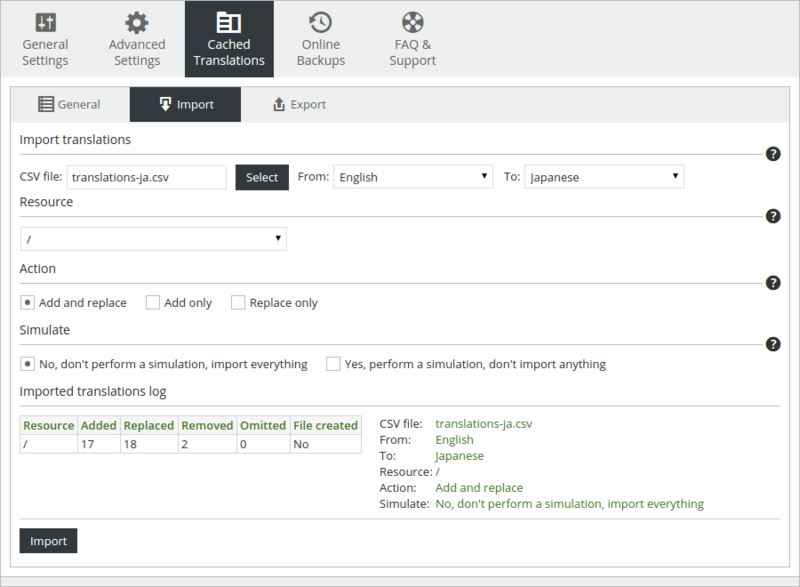 Added new panel to make online backups for settings and cached translations. Added new option to display languages in their own language. Added new option to define custom language names. Added new option to define custom CSS rules.